This post has been republished with the permission of Darrel Kirby, who regularly posts about Beer and Drinking in the Gloucestershire area. Please see his other blog posts here. Thank you Darrel for allowing us to share his insight to the phases of beer festival ! In my last blog I pondered the changing fashions in beer styles, based on the admittedly limited sample of one beer festival. Fashions for beer styles come and go: light and hoppy one year, dark and rich the next. 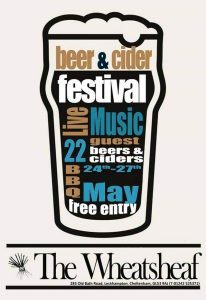 One thing that doesn’t seem to change, however, is the clear stages that a beer festival goes through over the weekend. 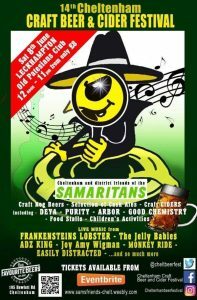 The Gloucester CAMRA Beer and Cider Festival doesn’t formally break down into sessions. You can turn up for opening at 11:30am and, if you have the inclination, stamina and beer money, you can stay right through to closing at 11pm. This doesn’t mean, however, that there are not clear demarcations throughout the day. This is the time of the beer enthusiast. Doors open at 11:30am. This is clearly advertised. Nonetheless there is always a queue forming outside from about an hour before. Most people have to work on a Friday morning, so these people are either retired or enthusiastic enough to take a day off to ensure they get first choice of the beers and ciders. For the true enthusiast, this first session is definitely the right time to come. The beer is still as fresh as it can be, there is no danger any of them having run out, and it is relatively quiet for the peaceful contemplation of your pint. There is not much music on a Friday afternoon, and what music there is tends toward the mellow. This year we had a set by an extremely good acoustic blues guitarist. At this earliest session you will find a greater concentration of well-lived-in anoraks, open toed sandals paired with socks and grizzly grey beards than perhaps anywhere else. Beer will be drunk in half or third pints to enable as many beers as possible to be tasted. The programme will be studied intently and lists of must-try beers will have been compiled in advance from the website. The beer list spreadsheet may have been sorted as required and printed off. You will see people armed with pens to tick off their beers in the programme or, in extreme cases, to make tasting notes in their well-thumbed, dog-eared notebooks. If you find yourself on the CAMRA recruitment stand, as I did for a few hours, you are in for a boring time: pretty much all of these people have been CAMRA members since Noah was a lad. It’s like selling ice to Eskimos. But these people are the beating heart of the festival – and indeed CAMRA as a whole. It is their enthusiasm that makes the effort of sourcing the wild, weird and wacky ales from all around the country worthwhile. The second stage starts probably around 7:30pm and is a bit more diverse than the morning session. Many of these people are still beer enthusiasts, keen to get in before the beer options begin to diminish, but they had better things to do during the day. These people tend to be younger – people who have finished work for the day or come from the nearby college. We advertised the festival at both Gloucester University and Hartpury college and had at least a smattering of attendees from each. There are also more women in attendance than in the morning. Friday nights are more lively – we have louder, more rocking music. More people are now drinking pints. By about mid-evening the first beers tend to start running out. This is the most mellow session of the weekend. You still get your beer enthusiasts on a Saturday afternoon, of course, but they are less intense. Saturday afternoon is about relaxing with friends and chatting over a leisurely pint – especially if the weather is good, as it was this year, and they can luxuriate in the sunny cloister courtyard. Some couples even come along with small children – as long as they are well behaved and don’t drink too much that’s fine. On Saturday afternoons we have a brass band. I’m not a huge fan of brass bands as a rule, but here it feels right and they are always good and very well received. This is also an ideal time to graze on the excellent Gloucestershire cheeses which have become so popular it is almost a festival in itself. By now beer choice starts to get more limited. This year we had run out of most of the stouts and porters and a number of the more unusual beers by quite early in the evening. 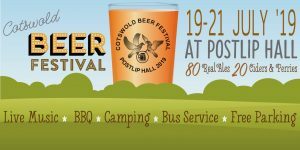 Any real beer enthusiasts turning up at this stage are either beer festival rookies or they will be complaining about the cruel hand of fate that kept them away until now. It’s not that there aren’t many beers available – there are still around 70 beers until quite late on – but clearly the most sought after have gone. Most Saturday night people aren’t too worried. They like a pint, welcome the choice, but aren’t interested in ticking off the beers or making tasting notes. People are now mostly drinking pints and dancing drunkenly to the band, loudly playing well known sing-along rock and pop songs. The bar staff are also getting into the spirit and dancing and singing behind the bar, despite feet and legs aching after 48 hours hard work. Perhaps it’s delirium. And then it’s all over. Time at the bar ladies and gentleman please: you don’t have to go home, but you can’t stay here. And this is why beer festivals are so great: there’s something for everyone. And lots of good beer and cider, obviously.